Learn About the Boys From The Lane! Are you a football fan? Do you support Tottenham Hotspur FC? Would you like to find out more about the club’s long and successful history? If you answered yes to any of these questions, you are certain to enjoy this informative Spurs reference guide.Did you know that Tottenham’s record cup win is 13-2, in an FA Cup game against Crewe during February 1960? Or that Steve Perryman holds the record at White Hart Lane for making the most League appearances at the club, with 653 starts and two substitute appearances? With 101 facts all about Spurs, this is the book that Tottenham supporters can’t be without. Perfect for match days or amusing the kids at home, this tribute to Spurs will tell you everything you ever wanted to know about this popular English Premier League team. So why not relive all those golden moments from days gone by and gen up on Spurs’ glorious past with 101 Interesting Facts About Spurs? 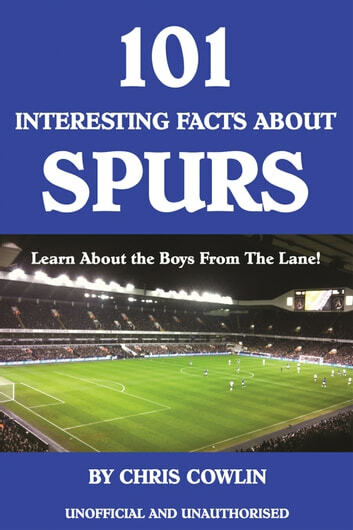 A simply must-have book for Tottenham supporters of all ages.